The Saint James’s Singers present a concert for Christmas on Saturday, 17 December at the Collegiate Church of St Mary, Warwick, starting at 7.30pm. It will include In Duci Jubilo, a tune recorded as early as the 1400s, with the familiar words and four-part setting arranged in the nineteenth century. 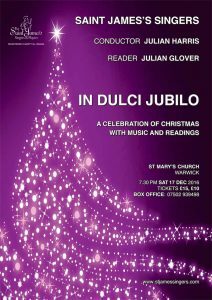 The Saint James’s Singers are delighted to announce that Julian Glover CBE will be our Reader. A veteran of film, television and the theatre, Julian has appeared in dozens of movies, plays and TV shows in a career spanning more than 50 years. Primarily a classical stage actor his theatre credits are numerous including many critically acclaimed performances with the Royal Shakespeare Company both in Stratford-upon-Avon and London. He has also been a familiar face on TV appearing in many popular series, most recently in Merlin and Game of Thrones. His talent for accents and cold expression made him an ideal choice for playing refined villains. During the 1980s, Julian achieved fame in Hollywood most notable with appearances as the Imperial General Maximilian Veers in The Empire Strikes Back (1980), the ruthless Greek villain Aristotle Kristatos in the James Bond film For Your Eyes Only (1981) and the deceptive American Nazi Walter Donovan in Indiana Jones and the Last Crusade (1989). The music will be a blend of familiar and less well known carols, including several audience favourites for the audience to join in. The choir will sing pieces by Guy Woolfenden and Steven Hancock, both composers closely associated with the choir; the much-loved In Dulci Jubilo as well as the sublime O Magnum Mysterium by Morten Lauridsen and the haunting Of a Rose from John Rutter’s Magnificat. In his 400th Anniversary year, Julian will read the only lines relating to Christmas which we can find in Shakespeare, plus words by Kipling, Laurie Lee and others, including the prolific and often amusing Anon!